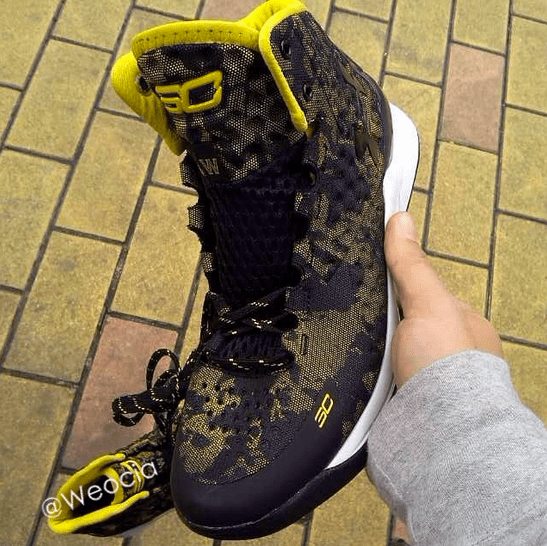 The Under Armour Curry 1 doesn’t have a release date, but there are a lot of Bay Area natives anticipating their release. This colorway sports a Black/ Yellow upper with a camo style print. Definitely look comfortable and the price should be easier on your wallet than other brand name signature models. Take a look at this new colorway below and share your thoughts in the comment section. Is this is his Veteran Day sig color way? Nice. Very nice. Happy to see UA finally give Curry the sig he deserves. Looks like a solid performer too. I’d put blue laces in them… I bought my first pair of UA ball shoes and they’re incredible. Hope cushioning wil be great and responsive. And yeah, must cop. That upper looks comfortable and UA cushioning doesn’t disappoint. I think that there might be a problem with the upper ripping. i hope its like jordans nowadays where they just show the players logo/symbol or whatever and not the brand symbol simply because the UA logo is just straight TRASH!! !